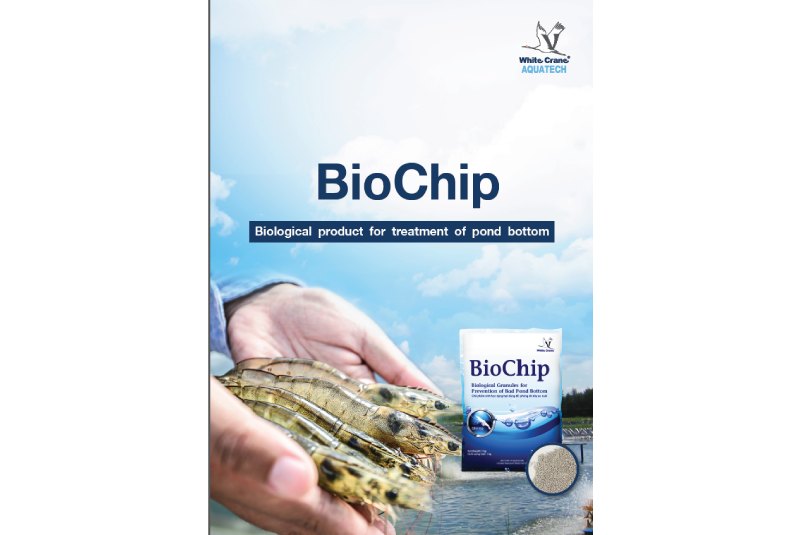 BioChip is a biological product to clean up pond bottom. When pond bottom is clean, shrimps will eat more, molt regularly and grow faster. BioChip can change water color from green to brown. BioChip can cure black gills, broken antenna, and tail rot disease. 1. For cleaning pond bottom, apply 1 bag (1 kilo) per 1,000 m2 pond daily for 3 days. 2. To cut down green plankton, apply 1 bag (1 kilo) per 1,000m2 pond daily at 8.00 a.m. until satisfactory level. 3. To reduce pH, apply 1 bag (1 kilo) per 1,000 m2 pond daily at 6.00 p.m. until satisfactory level. 4. To induce shrimp molt, has broken antenna, broken leg, and black gill, apply 1 bag (1 kg) per 1,000 m2 pond daily for 3 days at 6 p.m. Shrimps will molt and problems will be cleared. clean, no lab-lab or algae growing in pond bottom before adding water.